Sign up to Dry July Australia 2018 and raise funds for St Vincent's Hospital, Melbourne. St Vincent’s Hospital Melbourne provides the very best in patient care to people from all walks of life, especially those in need. St Vincent’s is known as the people’s hospital, treating more than 57,000 patients a year. This year we are celebrating saving lives for 125 years. Our Cancer Centre team make it their mission to provide the very best patient care to all of their patients. The Cancer Centre Chemotherapy Day Unit provides specialised treatment to 28 patients a day, both from the metropolitan and rural Victoria and the 6th floor look after inpatients that need further care and cancer treatment. • Small comfort items to help with patient wellbeing during their treatment. This is provides patents with access to newspapers, tea bags, biscuits and flowers to help them and their family feel relaxed and comfortable during their treatment at the Centre. We hope you will join us in going Dry this July and help us to continue to provide the best possible care to our Cancer patients at St Vincent’s Hospital Melbourne. Rebecca McConkey is a breast cancer survivor. Her strength and courage radiates when you speak to her. She beat cancer. Like thousands of other Victorians, Rebecca has committed to Dry July 2019 – she is driven to fundraise for St Vincent’s Hospital Melbourne’s Cancer Centre where she spent many hours throughout her treatment. 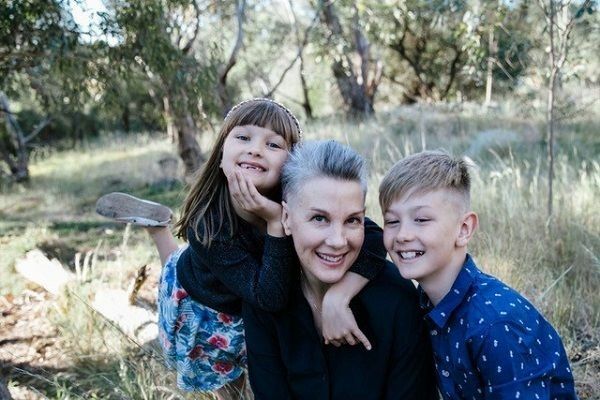 Rebecca was diagnosed with stage two breast cancer in 2018 and had to undergo a lumpectomy, radiotherapy and chemotherapy at St Vincent’s Hospital. After discovering the lump, she went to her GP who organised for her to have a mammogram, ultrasound and biopsy at St Vincent’s. When Rebecca had the surgery, the medical team discovered her cancer was a bit more aggressive than they first thought. So, it was suggested she do a short course of chemo - which is four rounds across 12 weeks - to mitigate any risk. When Rebecca meets new people, one of their first impressions is her positivity. She was thankfully able to harness this trait to remain upbeat during the whole process. She did say having the love and support of her wonderful husband, Jochen and her two kids, Heide (7) and Amos (10) helped her to cope. Rebecca is fortunate to work quite close to St Vincent’s. She did impress staff by riding her bike to the hospital to get her treatment. 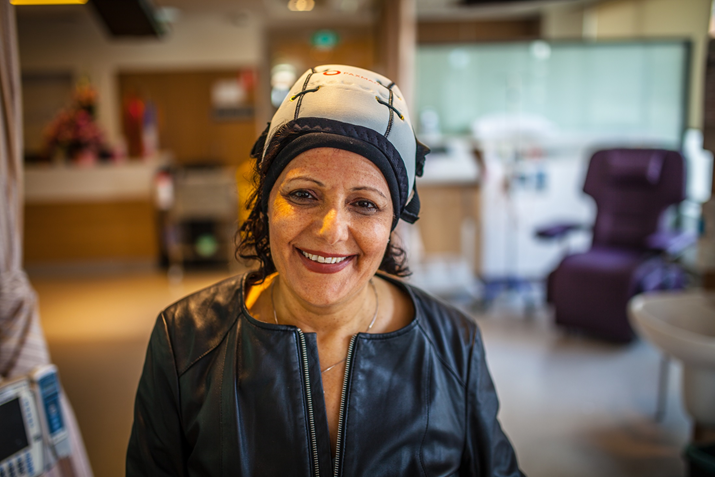 During her treatment at St Vincent’s, Rebecca was offered the opportunity to utilise the Scalp Cooling Cap program, to help reduce her hair loss. “It’s helped me from a mental perspective to move ahead and start to feel normal,” Rebecca said. 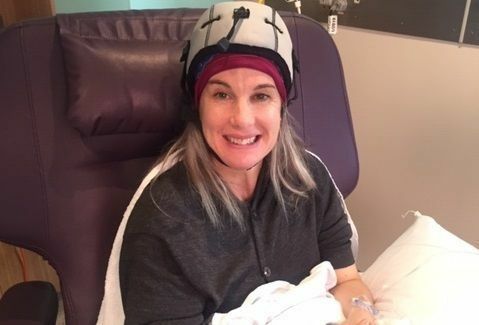 The money raised by the St Vincent’s Dry July team in 2018 enabled an additional six Scalp Cooling Caps to be purchased. All her follow up tests have been really positive. Rebecca will need to continue to take one of the drugs forever, otherwise there is no long term treatment plan. We're proud to announce that St Vincent's Hospital, Melbourne has received a grant from the Dry July Foundation 2018 Grant Program. Dry July funds used for the little things that make a difference! - Tim Tams are offered to patients and their families whilst undergoing treatment. Approved by our Dietician!We also offer varietal teas, herbal, relaxing and for general enjoyment. - Fresh flowers and Daily newspapers is welcoming for patients and their family members whilst attending the Cancer Centre. ‘It feels and sounds like rain, like it’s hailing on my head,’ Afaf explains, when the cap was first turned on. Afaf was diagnosed with stage 1 breast cancer last December and is receiving chemotherapy at the St Vincent’s Cancer Centre. This new piece of equipment will significantly transform the lives of people like Afaf by improving their self-confidence and identity during this difficult time. Along with the scalp cooling cap, Dry July donations will also be used to purchase patient comforts such as warm blankets, hot beverages and massage chairs to make a positive difference by providing an environment that is welcoming, supportive and comforting. Thank you to our generous donors who helped St Vincent’s Hospital achieve this significant outcome, ultimately helping to provide the highest quality in patient health care and medical equipment.